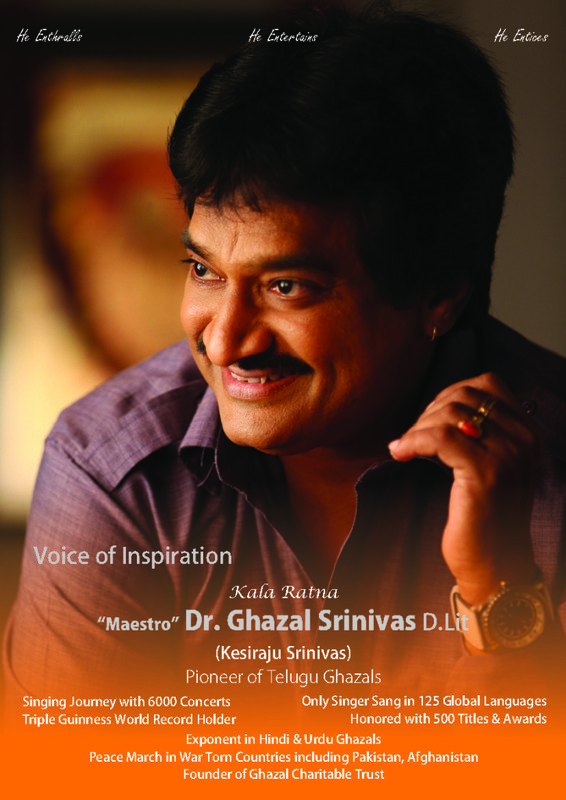 Ghazal Srinivas (Kesiraju Srinivas) is an Indian singer who is the Maestro and pioneer of Telugu Ghazal singing. He initiated and popularized Telugu Ghazal singing and soon rose to fame after his debut visit and performance in USA in the year 1992. His style of ghazal singing is unique to itself as he performs with only one accompaniment i.e., Kanjeera (Toumbarine). Dr. Srinivas achieved a special place for himself in the Galaxy of ghazal singers along with Jagjit Singh, Anup Jalota, Pankaj Udhas, Chandan Das, Hariharan, Talat Aziz and other ghazal singers.